Offering you a complete choice of products which include Carbide Dies such as Carbide Section Dies, Pipe Drawing Dies, Bar Drawing Dies, Tube Draw Dies, Carbide Plugs and Carbide Rectangular Dies. 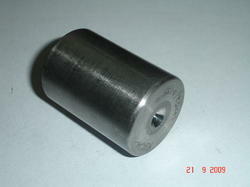 We make carbide Dies for Carbide Cold Heading Dies used in fastener industry. We have many satisfied customers in the field of rivets specially bimetal rivets . Apart from rivets, we make carbide dies for screws as well. We make plain bore dies, pointing dies, trap extrusion dies , aluminium cap extrusin dies. All dies are made using hot die steel case. Carbide Cold Heading Dies Carbide which is to be used in these carbide dies. Tungsten Carbide Dies are designed with high precision in order to meet the international quality standards. The offered dies are known for their robust designs, durable finish standards and longer service life. Apart from this, the offered tungsten carbide dies are available in various sizes and dimensions as per the varied needs of the clients. Looking for Carbide Dies ?